← The Book Launch Party at Boskone! At Boskone 50, attendees were treated to the covers of Boskone’s past, blown up to poster size and hung around the Galleria. It’s amazing to think of the rich history that Boskone holds for those in the science fiction community. Boskone guests and participants include well-known authors, Hugo award winners and more. Curious about learning more? 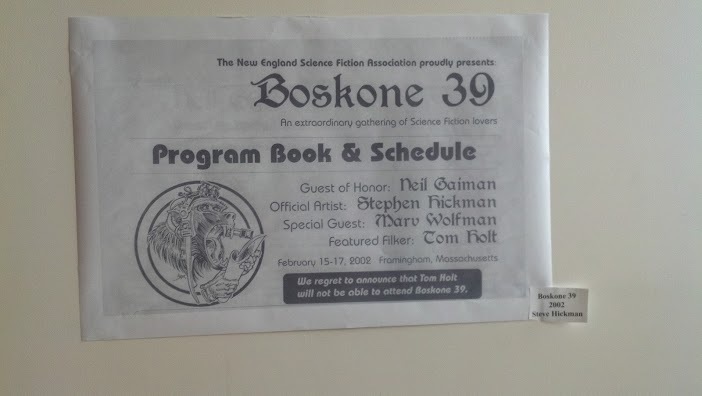 The New England Science Fiction Association (which hosts Boskone) lists a compiled list of Boskones past on their website. Clicking on the Boskone number, at the left most side of the chart, will bring you to that Boskone’s page. Enjoy! Get your Boskone membership today. This entry was posted in Boskone 51, Fun Stuff. Bookmark the permalink.